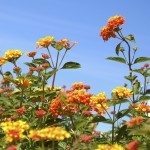 I have a couple lantana plants and some of them are nice and bushy and look great. Two of them have really thick woody brown branches that just kind of shoot out with some greenery and flowering, but they don't look nearly as nice as the others. Is there anything I can do to get them to fill out more rather than have these random long branches? Yes, you can prune the plants.